Planet come in a wide variety of sizes, compositions, and colors – and they can sometimes have rings. Where do these rings come from? Astronomers watching the repeated and drawn-out dimming of a relatively nearby Sun-like star have interpreted their observations to indicate an eclipse by a gigantic exoplanet’s complex ring system, similar to Saturn’s except much, much bigger. What’s more, apparent gaps and varying densities of the rings imply the presence of at least one large exomoon, and perhaps even more in the process of formation! J1407 is a main-sequence orange dwarf star about 434 light-years away*. Over the course of 57 days in spring of 2007 J1407 underwent a “complex series of deep eclipses,” which an international team of astronomers asserts is the result of a ring system around the massive orbiting exoplanet J1407b. The observations were made through the SuperWASP program, which uses ground-based telescopes to watch for the faint dimming of stars due to transiting exoplanets. The first study of the eclipses and the likely presence of the ring system was published in 2012, led by Mamajek. Further analysis by the team estimates the number of main ring structures to be 37, with a large and clearly-defined gap located at about 0.4 AU (61 million km/37.9 million miles) out from the “super Saturn” that may harbor a satellite nearly as large as Earth, with an orbital period of two years. 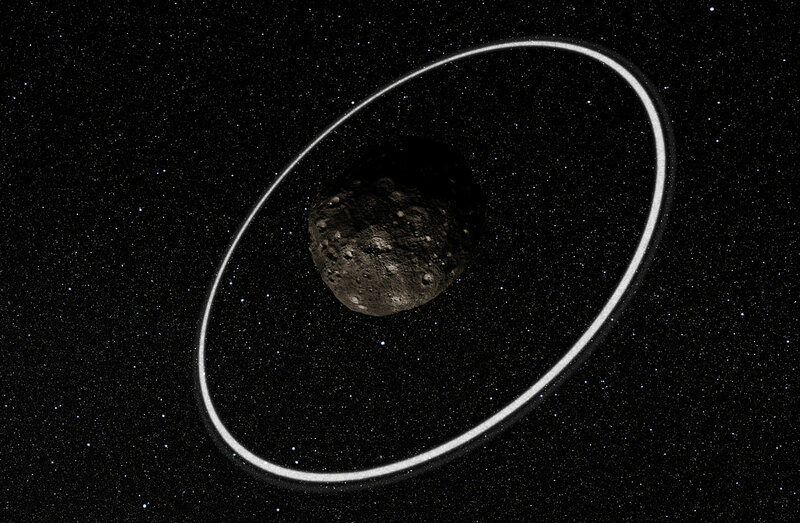 The entire expanse of J1407b’s surprisingly dense rings stretches for 180 million km (112 million miles), and could contain an Earth’s worth of mass. These observations could be akin to a look back in time to see what Saturn and Jupiter were like as their own system of moons were first forming. J1407b itself is estimated to contain 10-40 times the mass of Jupiter – technically, it might even be a brown dwarf. The team’s report has been accepted for publication in the Astrophysical Journal. Source: University of Rochester. Image credit: Ron Miller. We Earthlings love to dream, conjure and extrapolate. If you pose a question such as, “What if Earth had Saturn’s rings?” with all the resources available these days someone will not only answer the question but create some beautiful graphics to depict it! Yesterday, we saw this amazing graphic posted on reddit of a to-scale depiction of how Earth would look like with Saturn’s rings, and thanks to those who helped find the original source, the original image was created by John Brady at Astronomy Central. (We apologize… we originally credited the wrong person). Of course, “What if Earth had Saturn’s rings?” is not a new question. 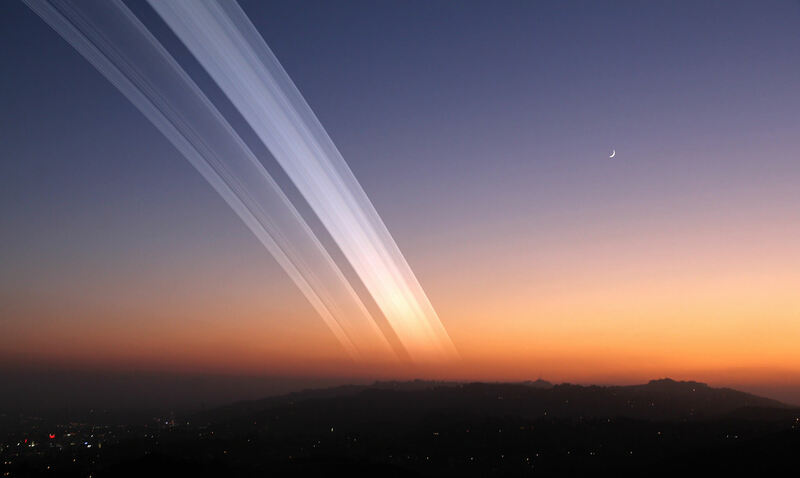 In fact we’ve discussed it previously on Universe Today, and in 2013, illustrator and author Ron Miller put together some incredible visualizations of what Earth’s skies would look like with Saturn’s rings. Phil Plait discussed the problems that might arise for us if there were Earthrings, such as the rings would change the amount of sunlight reaching the Earth, and our view of the night sky would be hampered. And then Earth could potentially be shredded by ring debris. 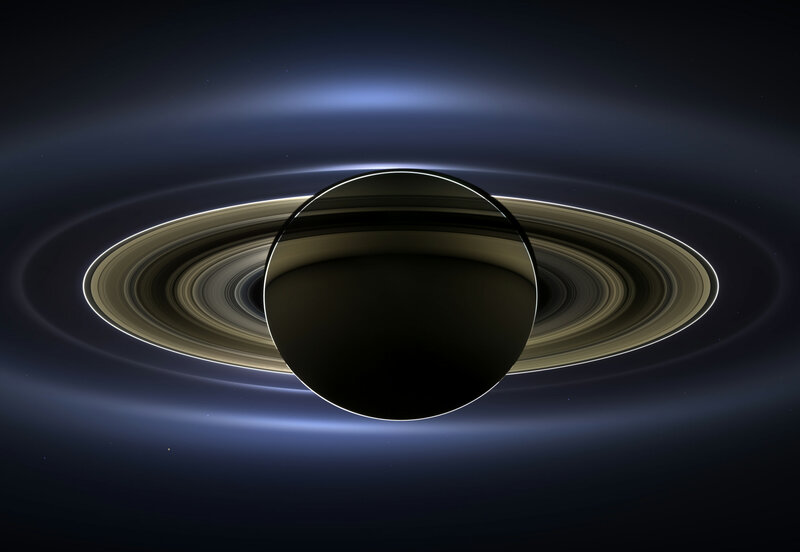 See more great size comparisons of things in our Solar System and Universe at John Brady’s post on Astronomy Central, including a look at how many Earth’s would span across Saturn’s rings. Rings are a tough phenomenon to spot. As late as 1977, astronomers thought that the only thing in the solar system with rings was the planet Saturn. Now, we can add the first asteroid to the list of ringed bodies nearby us. The asteroid 10199 Chariklo hosts two rings, perhaps due to a collision that caused a chain of debris circling its tiny surface. Besides the 250-kilometer (155-mile) Chariklo, the only other ringed bodies known to us so far are (in order of discovery) Saturn, Uranus, Jupiter and Neptune. “We weren’t looking for a ring and didn’t think small bodies like Chariklo had them at all, so the discovery — and the amazing amount of detail we saw in the system — came as a complete surprise,” stated Felipe Braga-Ribas of the National Observatory (Observatório Nacional) in Brazil, who led the paper about the discovery. Illustration of how Asteroid Chariklo may have gotten its rings. Copyright: Estevan Guzman for Universe Today. The rings came to light, so to speak, when astronomers watched Chariklo passing in front of the star UCAC4 248-108672 on June 3, 2013 from seven locations in South America. While watching, they saw two dips in the star’s apparent brightness just before and after the occultation. Better yet, with seven sites watching, researchers could compare the timing to figure out more about the orientation, shape, width and more about the rings. The observations revealed what is likely a 12.4-mile (20-kilometer)-wide ring system that is about 1,000 times closer to the asteroid than Earth is to the moon. 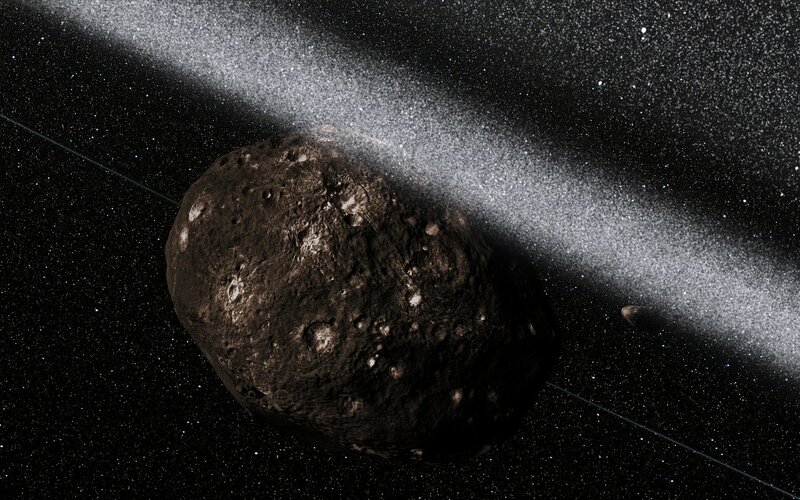 What’s more, astronomers suspect there could be a moon lying amidst the asteroid’s ring debris. If these rings are the leftovers of a collision as astronomers suspect, this would give fodder to the idea that moons (such as our own moon) come to be from collisions of smaller bits of material. This is also a theory for how planets came to be around stars. The rings haven’t been named officially yet, but the astronomers are nicknaming them Oiapoque and Chuí after two rivers near the northern and southern ends of Brazil. Because these occultation events are so rare and can show us more about asteroids, astronomers pay attention when they occur. Part of the Eastern Seabord enjoyed a more recent asteroid-star occultation on March 20. The original paper, “A ring system detected around the Centaur (10199) Chariklo”, will soon be available on the Nature website. A few preliminary images were released just a few days later showing the “pale blue dot” of Earth nestled within the glowing bands of Saturn’s rings. It was an amazing perspective of our planet, and we were promised that the full mosaic of Cassini images was being worked on and would be revealed in the fall. Download a full-size version here. In this panorama of the Saturnian system, a view spanning 404,880 miles (651,591 km), we see the planet silhouetted against the light from the Sun. It’s a unique perspective that highlights the icy, reflective particles that make up its majestic rings and also allows our own planet to be seen, over 900 million miles distant. And it’s not just Earth that was captured, but the Moon, Venus, and Mars were caught in the shot too. Read more: Could Cassini See You on the Day the Earth Smiled? See below for an annotated version showing the position of all visible objects, and read the full article on the CICLOPS page for an in-depth description of this gorgeous and historic image. 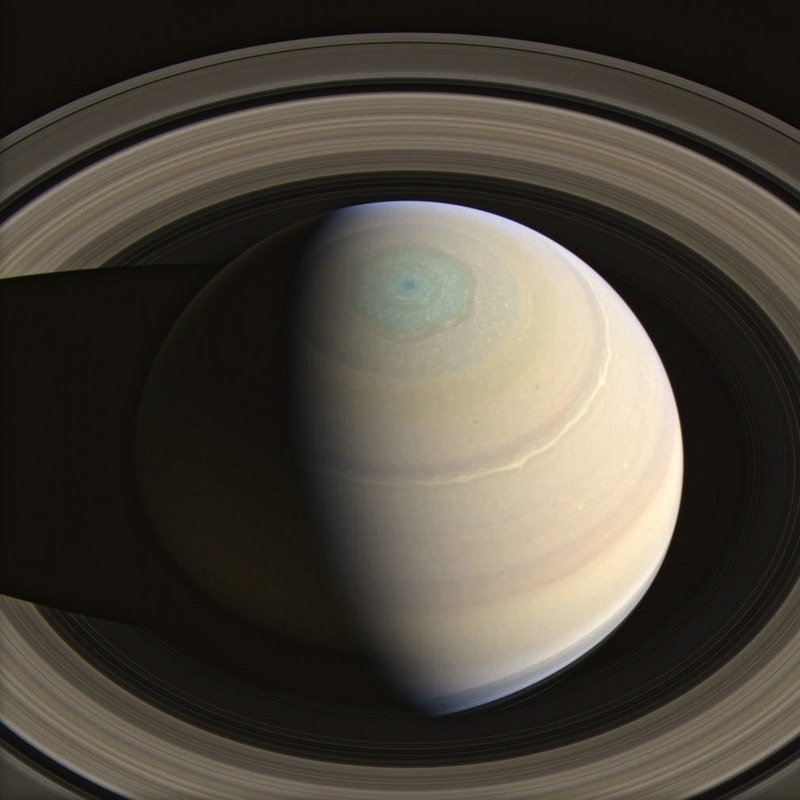 2013 Saturn mosaic, annotated version. We all know that Saturn’s moon Enceladus has a whole arsenal of geysers jetting a constant spray of ice out into orbit (and if you didn’t know, learn about it here) but Enceladus isn’t the only place in the Saturnian system where jets can be found — there are some miniature versions hiding out in the thin F ring as well! Watch the 50-mile-wide Prometheus dip into the F ring (CLICK TO PLAY) NASA/JPL/SSI. Animation by J. Major. The image above, captured by the Cassini spacecraft on June 20, 2013, shows a segment of the thin, ropy F ring that encircles Saturn just beyond the A ring (visible at upper right). The bright barb near the center is what scientists call a mini jet, thought to be caused by small objects getting dragged through the ring material as a result of repeated passings by the shepherd moon Prometheus. Coincidentally, it’s gravitational perturbations by Prometheus that help form the objects — half-mile-wide snowball-like clusters of icy ring particles — in the first place. Unlike the dramatic jets on Enceladus, which are powered by tidal stresses that flex the moon’s crust, these mini jets are much more subtle and occur at the casual rate of 4 mph (2 meters/second)… about the speed of a brisk walk. The reflective jets themselves can be anywhere from 25 to 112 miles (40 to 180 kilometers) long. Various images of mini jets captured by Cassini from 2005 to 2008. 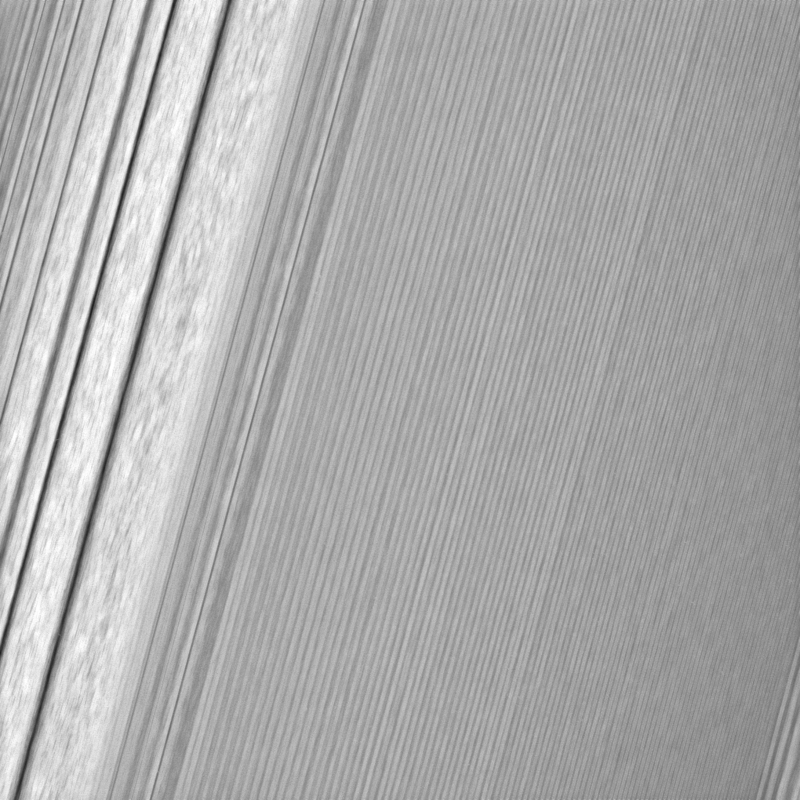 Over 500 of these features have been imaged by Cassini since 2005. Read more about mini jets here.